"The League of Women Voters was founded by Carrie Chapman Catt in 1920 during the convention of the National American Woman Suffrage Association. 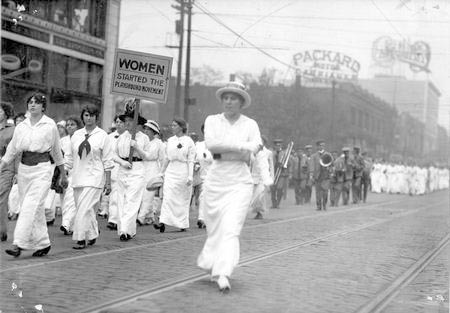 The convention was held just six months before the 19th amendment to the U.S. Constitution was ratified, giving women the right to vote after a 72-year struggle. This holds true today. The League is proud to be nonpartisan, neither supporting nor opposing candidates or political parties at any level of government, but always working on vital issues of concern to members and the public. The League has a long, rich history,that continues with each passing year." Want to know more about LWV? State of Iowa League website -- with links to local Leagues and more. National League of Women Voters website -- with links to resources, Position Statements, and more. Stand in support of voting laws that keep voting accessible and oppose any efforts to put barriers between citizens and their right to vote. Build on the Secretary of State's online voter registration system to allow all Iowans--including those without state-issues IDs and driver's licenses--to register to vote electronically. Change Iowa's laws and constitution to restore voting rights to felons who have completed their criminal sentences. Protect Iowa's water resources by fully funding the Iowa Natural Resources and Outdoor Recreation Fund and the Resource Enhancement and Protection (REAP) Program. Provide funding to help Iowa's communities update their water and wastewater infrastructure and adopt meaningful and long-term nutrient reduction strategies. Build on the success of Iowa's landmark bottle bill by expanding it to non-carbonated plastic bottles and doubling the handling fee to retailers and redemption centers. Unclaimed refunds should be used to enhance the redemption system so that access is available throughout the state. Provide greater judicial flexibility in sentencing by eliminating mandatory minimums, and oppose all efforts to reinstate the death penalty. Prohibit employers from asking about criminal convictions at the time of application for employment. Enact laws and policies to ensure access to mental health services, address Iowa's mental health workforce shortage, and guarantee a continuum of mental health services are available throughout the state.